Brazilian devotion to the Catholic Church has declined over the past several years. Whereas Brazil was once an almost entirely Catholic nation, only 74% of Brazilians today admit allegiance to Rome, with large numbers, especially the urban poor, having defected to Protestant Evangelical sects. Many more water down their Catholicism with dashes of African religions such as Candomble or spiritist beliefs such as Kardecism. Only recently has the decrease in Catholic affiliation seemingly leveled off. In Brazil, that hard line carries over into public life and government policy. While equally devout neighbors Mexico, Colombia and Uruguay have taken steps to give women more of a say in the matter of terminating pregnancies, Brazilian public opinion supports the status quo, and the country’s Congress last year voted overwhelmingly to reject a modest attempt at decriminalizing abortion. The advances that have taken place are mostly local initiatives carried out almost surreptitiously, such as the move by São Paulo states to offer the morning-after pill and heavily discounted contraceptive pills at state-run pharmacies. President Luiz Inácio Lula da Silva did make a halfhearted attempt to spur a national debate last year, calling abortion a public-health issue  even as he declared himself steadfastly against it. But with the Church quick to stifle such talk and the general public not sufficiently engaged to demand action, the debate never took off. 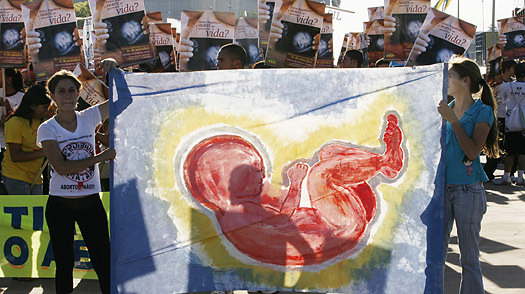 In truth, abortions and unwanted pregnancies are a sad constant in Brazil. Although abortion is illegal, an estimated 1 million women each year have one. The poor are forced into clandestine clinics or take medication, while the better-off are treated by qualified physicians at well-appointed surgeries known to anyone with money and overlooked by colluding authorities. That secrecy has a price. More than 200,000 women each year are treated in public hospitals for complications arising from illegal abortions, according to Health Ministry figures. Those who don’t have the courage or the money to be treated take the pregnancy to term. Although the fertility rate has fallen considerably in Brazil , 1 in 3 pregnancies is unwanted, according to Dr. Jefferson Drezett, head of the Hospital Perola Byington, Latin America’s largest women’s health clinic. Meanwhile, 1 in 7 Brazilian women between the ages of 15 and 19 is a mother, and the average age at which women have their first child has fallen to 21, from 22.4 in 1996, according to a government-funded study. See a story about the Pope, Catholic judges and abortion.